Neal “Albert” Denning a Willow Springs, NC native was born on February 18, 1947. “Albert”, loved gardening and was a member of his high schools Future Farmers of America. Albert dreamed of going to college and joined the Marines with the intentions of attending college after Military service. Unfortunately those dreams never came to fruition. On May 12, 1966 at the young age of 19, that dream died when Albert made the ultimate sacrifice for his country. Albert was part of a 14 man patrol that went out to secure our perimeter on the morning of May 12th. The patrol was ambushed and overrun by an overwhelming number of Viet Cong. A second patrol attempted to locate and reinforce them. By the time the patrol was located it was determined that they had come across a Viet Cong stronghold. A battle ensued lasting well into the night but efforts to save the patrol were in vain. Two Marines survived the attack and were Medevaced to safety. The men bravely fought off the Viet Cong for as long as they could. Running out of ammunition, they fought hand to hand until all was lost. He served our country for less than a year. PFC Denning is on panel 07E, line 052 of the Vietnam Memorial Wall in Washington D.C. The Vietnamese Military Merit Medal (Vietnamese: Quân công bội tinh) was the highest military decoration bestowed to enlisted, by the Republic of Vietnam (South Vietnam) during the years of the Vietnam War. The medal was established on August 15, 1950. The Military Merit Medal was modeled after the French Médaille Militaire and was awarded mostly to Enlisted Men for valor in combat. The Vietnamese National Order of Vietnam was considered the equivalent decoration for military officers. 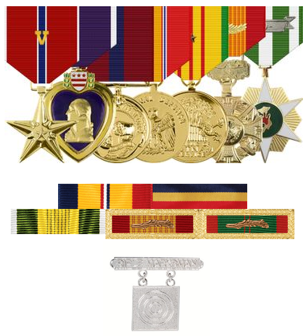 The United States military authorized the Military Merit Medal as a foreign decoration and permitted the medal to be worn on U.S. uniforms by enlisted personnel. A high number Military Merit Medals were issued posthumously as the medal was most often awarded to United States servicemen who were killed in action. The Military Merit Medal was last issued to U.S. personnel in 1973 and was discontinued after the fall of South Vietnam in 1975.